Your little one is quite the patriot. She loves celebrating every single holiday, from Memorial Day and Fourth of July to the more obscure holidays: National Cat Day (October 29th) and, of course, National Cookie Day (December 4th). We celebrate that last one pretty thoroughly, ourselves. What, then, is the perfect costume to help your gal get into the spirit of not one, but TWO wondrous holiday celebrations? 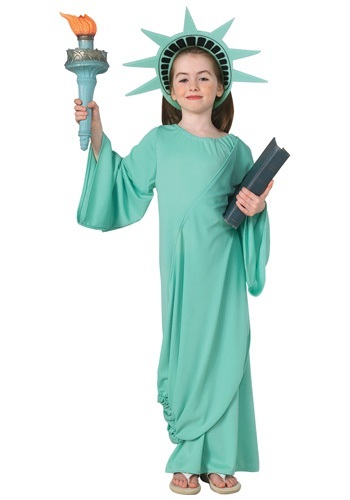 This Child Statue of Liberty Costume will be a hit at every single Halloween house she hits up for candy, then she can rock it again to entertain your guests at your annual Independence Day barbecue. After all, this giant green lady has been hanging out off the coast of New York City keeping a watchful eye on the country she loves, and your little one is known to embrace everyone she meets with open arms and caring cuddles. Seems like a perfect match to us! You may want to teach her to recite “The New Colossus” as she parades around the house wearing the flowing mint green dress and foam crown headpiece of this costume. Pick her up a torch to carry and she can feel like the party-ready patriot she is. You may even take this moment as an opportunity to teach her to stand really still and silent, and even read that book she’s toting around.